I rode all the way up the steep face of downtown Juneau just to confirm that my favorite trail near town is in fact closed. A sign at the trailhead informed me that it would remain that way until after Christmas. Apparently, the CBJ (an acronym which, when spoken out loud, can only be a disdainful reference to the City and Borough of Juneau) decided that the Perseverance Trail isn't enough of a highway already, and they're blasting out big chunks of mountain until the New Year. Truly disappointing. So instead I wheeled over to Salmon Creek with this crazy idea to run up to the reservoir. I haven't done any free running, at all, since knee problems bogged me down in February. I haven't even hiked since the foot fiasco in late September. But I'd like to get back into both for the fitness benefits, and two slow, uphill miles seemed like a good start. 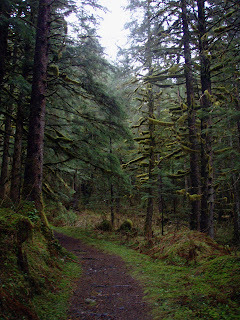 Salmon Creek is a lightly technical trail with steady but steep elevation gain. These are the kind of trails where Geoff does most of his running, and I think I may understand why. I became so absorbed in dodging wet roots, leaping over mudholes and sprinting up veritable cliffs that I completely forgot that running is tedious and not very much fun at all. And in a matter of minutes (maybe 20?) I was at the top, lungs searing and face soaked in sweat because I am just not used to high intensity. But it feels good to get back out there in the world where bikes can't tread, to pound my bones a little, to overtax my heart a little, to feel shaken and alive. I walked back down the trail, lined in brilliantly green moss and fresh shoots of some kind of leafy groundcover. I took this photo about 150-200 feet below snowline, which is nearly 1,000 feet above where the snowline was two weeks ago, when this area was likely covered in at least six inches of powder. This is one thing I really like about living in this soggy part of the state. Even during the early winter, spring is always just around the corner. All it takes is one warm week, even if the threat of a dozen frozen weeks lie in the near future. New life just keeps on trying. Only that i can say... It's really beautyfull nature. Wow Jill, thats pretty impressive that you were able to run uphill so far after not running in awhile. No knee trouble then? Rock on!!! I'm just 6 years into this winter cycling thing your wealth of knowledge is priceless. 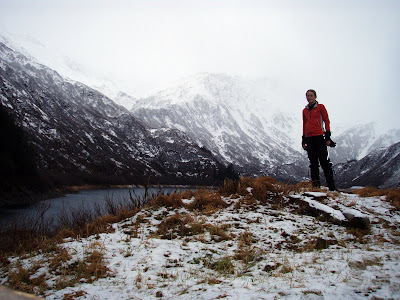 Here is my winter cycling blog.